We visited this recently opened museum yesterday. It was one of the most moving experiences of my life. Every community in the world who played their part took their place in the involving and graphic displays, but the inevitable focus was Central Europe and Poland in particular. I hadn’t really realised how protected we were on our little island from wholesale displacement, from the destruction of communities, from unbelievable and barbaric cruelty to citizens and soldiers in many parts of continental Europe. Maps, displays of humble artefacts, moving personal testimonies told the stories of families torn apart, of wanton destruction and cruelty far beyond the concentration camps. We spent four hours there. We could have spent days. It was utterly harrowing, utterly memorable. Most of my photos are on my camera. I’ll simply show this. We walked past screen after screen with images like this. 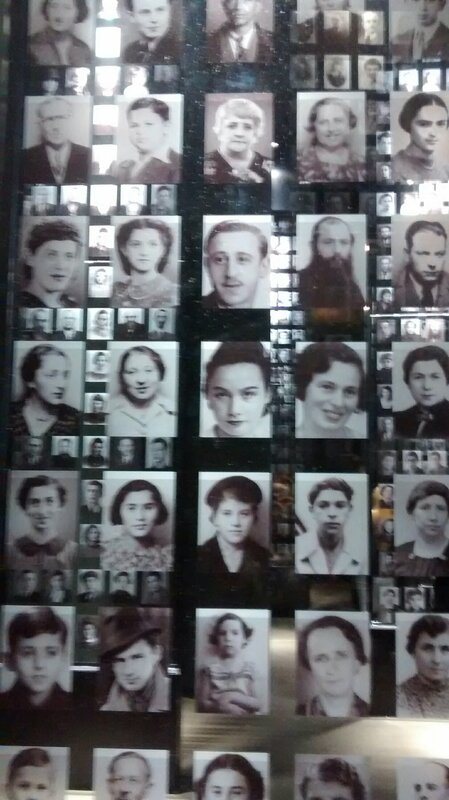 Every portrait is of one of the countless Jews who lost their lives under the Nazi regime. It must have been almost unbearably heartrending. So important though to have museums like this to remind us and inform us of what happened to so many, and reveal the horrifying cruelty to ordinary people and ordinary families. Also important to have such places that honour individuals and where we can go and pay our respects to those who were lost to the world and who lost everything. Thanks Margaret. It was emotionally draining. But I’m so glad we went. I’d like everyone to have that opportunity, as what this museum has to say should be heard by all. It is so shocking, but so important to remember. Every surviving photo brings home and reinforces the truth of how many real, living, individual human beings suffered. Don’t you find it also encourages us to consider the people suffering ethnic cleansing today in various parts of the world. You would think that humans could have to learnt to rise above this kind of abomination by now. Thank you for sharing. We do seem reluctant to learn from the past. It was a very sobering afternoon. I sort of had to. My father, like so many young men of his generation, fled Poland as the war began. It’s part of my history. You were brave to go. I want to remember but am not able to see the graphic details. Thank you for sharing your emotional journey. It is one I have on occasion, wondered if I could handle. Sadly, history has taught us very little. You’re right, we’ve learnt little. I’m so glad we went, tough as it was. I’m so grateful not to have been put to the test. Thank you for sharing this, Margaret. So important not to forget – and to learn from these sobering reminders. But do we remember? Evidence from the recent past suggests not, sadly. I agree that you were brave to go–it’s not easy to walk, knowingly, into a difficult, emotional experience. It does sound like a very effective, and poignant and wrenching, museum. It was brilliant. And we had no real idea of what we were getting into when we first went. I need to go again, as after four hours we were barely even going through the motions. This sounds like an excellent museum! There are now so few people left who actually remember what it was like during WW2 that the horror of it has dulled. We think of that time as ‘history’ and individuals and their suffering are not really considered. The video testimonies of survivors were definitely the most moving and hard to watch. Thank goodness those records have been made. You are so right, Margaret. As difficult as this history will always be, these are stories that must not be forgotten. The museum is making a fine effort, I think. Museums like these are harrowing, difficult to comprehend how brutal people can be. I would like to say that it doesn’t happen now but sadly I can’t. Listening to Aung San Suu Kyi wondering why the Rohingya were leaving left me cold. I know. Nothing seems to change for the better.